The two most common methods of taking anabolic steroids are orally or by injection. There are pros and cons to both methods; lets take a look at each more closely. Oral steroids have greater chance of side effects due to the fact that when they are ingested, they have to pass through and be broken down by the liver in order to be passed into the bloodstream and their effects utilized. Steroids taken orally are subject to aggressive action by the liver whose main job is to protect the body by ridding it from toxins. This puts a great deal of strain on the liver and, in cases of abuse; this can result in significant liver damage. Oral steroids are made to withstand the liver pass through process therefore they are made more potently knowing that some will be lost during that process. They also have to be taken in higher amounts to make up for the percentage that is broken down and lost during the liver bypass. Oral steroids have a shorter metabolic "half-life" than injectable steroids. A "half-life" is how long it takes your body to eliminate half of the drug from your body and is commonly referred to as the amount of time it stays in your system. Oral steroids only last 3-5 hours per pill due to their shorter half-lives. Therefore, oral steroids need to be taken several times each day putting even more strain on the liver. Their shorter half-life also makes oral steroids less easily detectable by drug tests. This is due to the fact that they are completely eliminated by the body usually with in a few weeks time. So oral steroids become a safer route for athletes looking to improve performance while escaping from drug testing. Beginners to steroids are often unsure of injections and do not feel comfortable injecting themselves. There is fear of missing the target area and accidentally injecting the drug into a tendon or vein, which can be dangerous and can lead to infection or potentially fatal blood clot. There is also a fear of needles and the associated pain and possible sight of blood. Often there is a sort of anxiety associated with self-injection and mentally is linked to crossing over to a “dark side” of drug use. People have been comfortably swallowing pills since they’ve been old enough to swallow and although the injectable route can be less hazardous, the oral route seems less risky and druggie-esque a practice to a new steroid user. This makes oral steroids very popular in the underground bodybuilding community. Injectable steroids are theoretically safer than the oral version because they do not have to be digested and passed through the liver for breakdown. They are not as stressful on the liver as orals and are much less potent because they don’t have to be made to withstand the liver bypass. 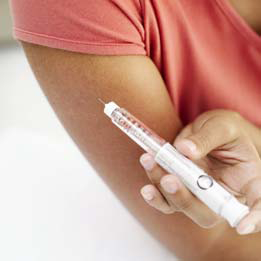 Injectable steroids are either water-based or oilbased. The water-based steroids are generally shorter in half-life than oil-based steroids, which are much longer in comparison to oral steroids. This ultimately means that oil-based steroids generally exhibit the most delayed uptake into the body (effects last the longest). However, this also makes oilbased injectable steroids the most readily detected by drug tests.